This summer is just flying by for me but I am trying to enjoy it as much as possible. Summer for me means lots of outdoor grilling as my kitchen here in Umbria gets very warm if I turn my oven on for any length of time, so I try and do any baking first thing in the morning, and we fire up the grill often to cook dinner. I think almost everything tastes better grilled, and particularly vegetables, as the heat of the grill caramelizes the natural sugars bringing out the best flavor of whatever vegetable you grill. 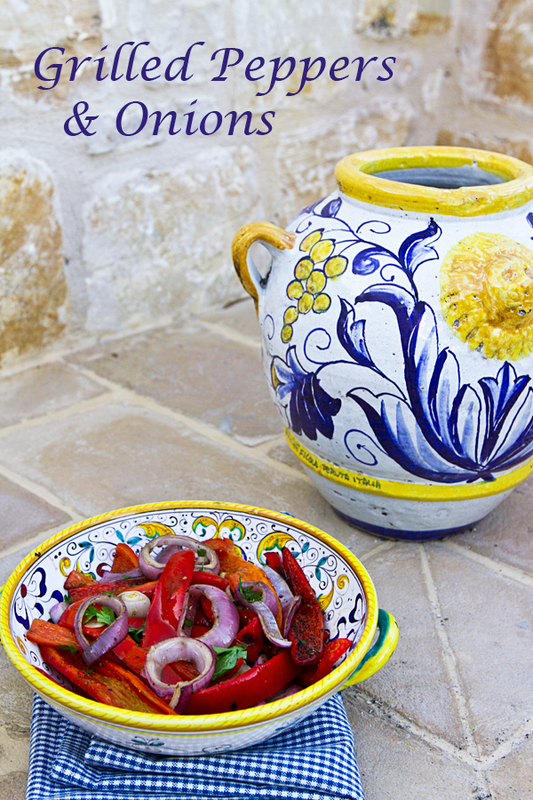 This combination of grilled sweet peppers and onions is a good one as both these vegetables become sweeter when cooked. I serve this dish as a vegetable side dish with grilled meats, but if you drizzle a little balsamic vinegar on top, you could also serve it as a salad. Onions are a very good source of vitamin C, B6, biotin, chromium, calcium and dietary fibre and also contain good amounts of folic acid and vitamin B1 and K.
Grilling vegetables such as peppers and onions caramelizes the natural sugars bringing out the best flavor. Fire up your grill and bring the coals to medium high heat. Core the peppers, discarding the seeds and membranes and cut into quarters lengthwise. Cut off the ends of the onion, peel, and cut into four slices crosswise. Use metal skewers, and push them through each slice of onion to secure the onions for the grill. 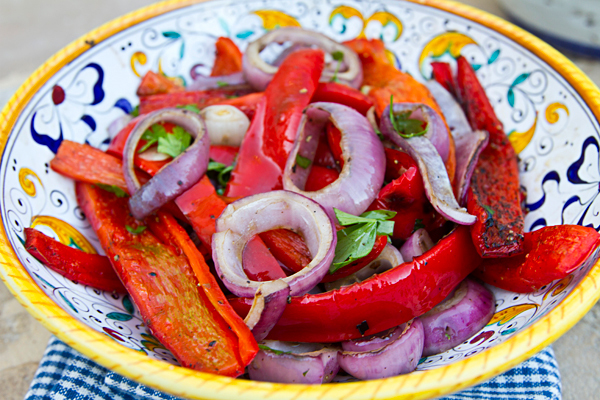 Grill both the onions and peppers until softened and slightly charred. 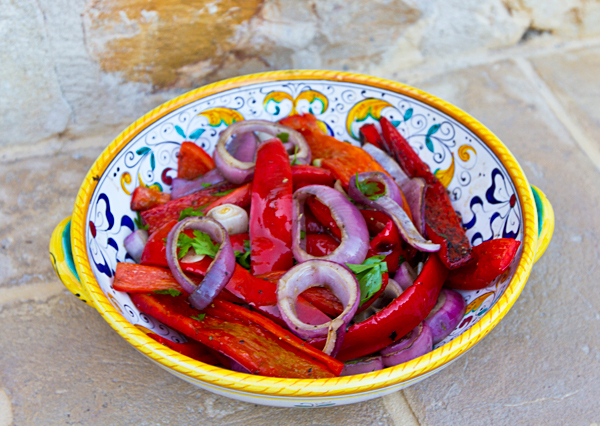 Cut the peppers into 1 inch strips and toss in a bowl with the onions, olive oil, salt, pepper, and parsley.